 Why should I choose the Geneva Academy? Why should I apply for the LLM? What Distinguishes the LLM from the two other master programmes offered at the Geneva Academy? Does the LLM offer exposure to practical work with human rights and humanitarian actors? Do you offer scholarships for the LLM? What job opportunities are available after I complete the LLM? Can I do a PhD after I complete the LLM? Does the LLM offer distance-learning courses? Which degree will I receive after successfully concluding the LLM? What are the criteria for admission to the LLM? If I don’t have a law degree, can I still apply for the LLM? I want to apply for the LLM but have not yet completed my current degree. Will you consider my application? If my application is not successful, can I reapply next year? If I have been admitted to the programme, can I defer my offer to next year? Do I need a visa to study on this programme? What are the advantages of living and studying in Geneva? What is the cost of living in Geneva? How do I find accommodation in Geneva? Can I stay in Switzerland after my studies? The Geneva Academy is a leading research and education institution in international humanitarian law (IHL) and human rights (HR) . Students enrolled at the Geneva Academy have the opportunity to be taught by leading academics in the field. We have developed close collaborations with Geneva-based HR and humanitarian actors and regularly welcome their experts to events, policy discussions and taught sessions. Thanks to these collaborations, our LLM offers students numerous internship and networking opportunities, which allow them to gain practical experience and make useful contacts for their careers. Our LLM in is one of the most innovative and intellectually challenging programmes in IHL and HR offered in Europe today. The Geneva Academy proposes three distinct master’s programmes: an LLM in International Humanitarian Law and Human Rights, a Master of Advanced Studies in Transitional Justice, Human Rights and the Rule of Law and an Executive Master in International Law in Armed Conflicts. Our LLM in International Humanitarian Law and Human Rights (60 ECTS) is a one-year full-time postgraduate degree. It is designed for intellectually curious and thoughtful candidates with a law degree who want to gain advanced, comprehensive and practical training in international humanitarian law, international human rights law, international criminal law and the interplay between them. Our Master on Advanced Studies in Transitional Justice, Human Rights and the Rule of Law (60 ECTS) is a one-year full-time postgraduate degree. It is designed for highly qualified and open-minded candidates interested in acquiring high-level academic education and real-world practice in the field of transitional justice, human rights and the rule of law. Primary focus is placed on strengthening interdisciplinary knowledge and preparing students for future professional activities. Our Executive Master in International Law in Armed Conflicts (60 ECTS) is a part-time programme designed for professionals - diplomats, legal advisers and professionals working in emergency situations who are active within the UN, other international organizations and NGOs- who want to gain a thorough understanding of the laws of war and how to apply them in complex contemporary contexts. During the Spring Semester, as an alternative to optional courses, students can acquire first-hand professional experience of working in Geneva-based international organizations and NGOs, including the International Committee of the Red Cross (ICRC), Office of the UN High Commissioner for Human Rights (OHCHR), International Law Commission (ILC) or UN Children’s Fund (UNICEF). LLM students also have the opportunity to participate in moot courts and public pleadings, a key exposure to a variety of simulations and role-plays in IHL and HR. In 2016, the Geneva Academy team won the prestigious Jean-Pictet competition. We offer a number of full scholarships (covering tuition fees and living expenses in Geneva for ten months) and partial scholarships (covering tuition fees). Scholarships are awarded to outstanding candidates who lack the financial resources to cover the tuition fee and/or cost of living in Geneva. As the LLM combines theoretical knowledge with internships and participation in moot courts, it provides a solid foundation for careers in the humanitarian and HR fields with international organizations, NGOs, international courts and tribunals, governments and academic institutions. A significant number of LLM graduates work for the International Committee of the Red Cross (ICRC), in the field as well as at the Geneva headquarters, OHCHR, and other international organizations, NGOs, academic institutions, governments and international courts and tribunals. During the year, our students also have access to a rich network of experts and practitioners and benefit from the Career Service of the Graduate Institute of International and Development Studies. The Geneva Academy does not offer PhD programmes. Yet, a number of graduates have been accepted in PhD programmes at the University of Geneva, the Graduate Institute of International and Development Studies and other universities. The LLM is a full-time programme and no distance-learning courses are offered. An LLM/Master of Advanced Studies (MAS) (60 ECTS credits), awarded by the University of Geneva and the Graduate Institute of International and Development Studies. The LLM is open to candidates who have a full degree in law; a demonstrable interest in IHL and HR (i.e. internships, summer school, conferences attended, etc. ); a good background in public international law and a sound command of English. A passive knowledge of French is an asset. Candidates with degrees other than law but with a significant amount of training and experience in public international law, IHL, international human rights law and international criminal law can be accepted to the programme. You may apply for the LLM during the last year of your degree. We will consider and assess your application based on a current transcript and grades obtained so far. If we offer you a place, it will be conditional and you must send us your final results and evidence that your degree has been awarded as soon as these become available. The final decision will depend on whether you meet the specific requirements (minimum grades) that the Admissions Committee sets. Previously unsuccessful candidates can reapply for the LLM. This will not have a negative influence on the selection process. It is not possible to defer an offer. If you have to defer your enrollment in the programme, you will need to reapply and be considered with the new pool of candidates. Students who are nationals of countries outside the European Union (EU) need a visa to enter Switzerland and to stay for more than three months. When offered a place, students should consult the nearest Swiss embassy about the procedure. As the visa process may take several weeks to a few months, students should apply to the nearest Swiss embassy as soon as they have been admitted to the LLM. Geneva offers an excellent quality of life: international quality of life indices consistently rank it among the top ten cities in the world. As the European headquarters of the United Nations (UN) and the most active location in the world for multilateral diplomacy, Geneva is home to dozens of international organizations, more than 250 NGOs and 174 state representations, with more than 29,000 persons employed in this sector. Every week, events organized by the Geneva Academy, Graduate Institute of International and Development Studies, University of Geneva, international organizations and NGOs feature leading experts in IHL and HR. These events directly touch upon topics addressed in the LLM. The city is clean and safe, with high-quality public facilities. It is easy to get around either by bicycle or public transport. Geneva Academy students have access to the University of Geneva’s sports and cultural facilities. At the Graduate Institute Ciné-club, students can attend free film screenings, which are followed by a debate. To meet living costs, students will need a minimum of about 1,600–2,000 Swiss Francs per month if they live in a student's residence and 1,900–2,100 Swiss Francs per month if they live in a private residence. Our students receive a residence permit on arrival, which allows nationals from the EU to work up to 15 hours a week. It is possible to work full-time (40 hours a week) during official holidays. Non-EU students, however, are not allowed to undertake paid work for the first six months of their stay. After six months, they can work up to 15 hours a week, except during official holidays when it is possible to work full-time (40 hours a week). As the LLM is a full-time intensive programme, we would not advise our students to find intensive employment that might interfere with their academic performance. Students should start looking for accommodation as soon as they have been admitted to the programme. The Geneva Academy can only provide a few places in student accommodation. We therefore encourage students to look for their own accommodation and not count on what is available via the Geneva Academy. LLM students can extend their residence permit for up to six months following the completion of the programme (July to December), to undertake an internship or a temporary assignment related to their studies in a Geneva-based institution, and/or to look for a job in Geneva or Switzerland.